With a single Registration, a participant can participate in all the above events. Registration will be Online (through Debit Card, Net Banking or Credit Card) and Offline (through your College Representatives or at Mywbut office). Participation Certificate will be provided to all the participants . Opportunity for Internships, Discounts in Winter Training 2017-18 Courses for the top rankers of any of the event. More than 500 Prizes to be won. 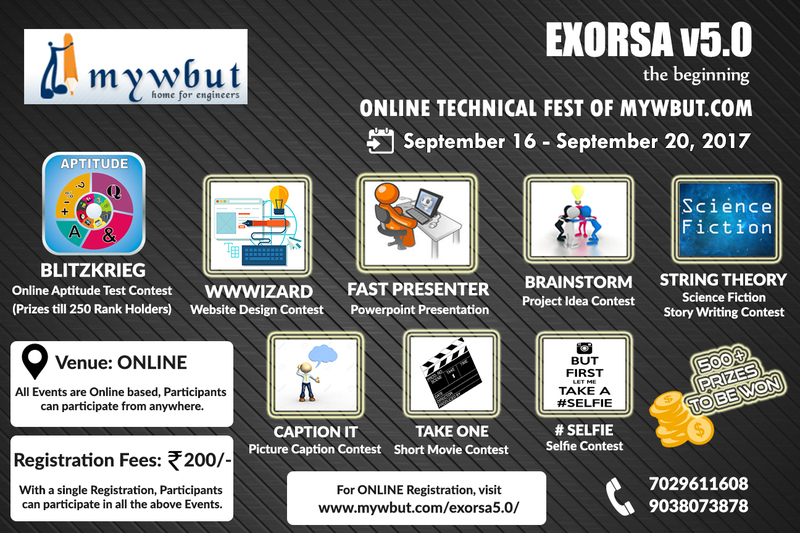 For more details, browse the website or visit EXORSA v5.0 @ Facebook or Contact your College Representative or Call MYWBUT at +91-7029611608 / +91-9038073878.